Grzybowo is a mid-size village situated 6 km northeast of Wrzesnia on the road Wrzesnia-Witkowo. The impressive ramparts are clearly visible approx. 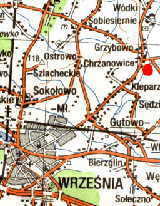 400 meters to the west from the elementary school, which is housed in an old manor of the Lutomski family (see the red dot on the map). It is one of the largest fortified settlements built in the early Middle Ages in Great Poland. The site covers an area of approx. 5 hectares. Even today, some segments of the ramparts reach a height of 8.5 meters above the moat. 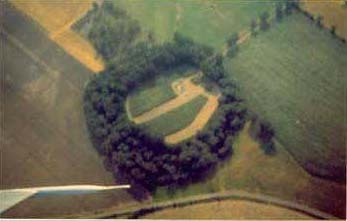 They are overgrown with old trees and dense bushes that has slowed erosion and contributed to the excellent preservation of the site (see aerial photo). The fortified settlement was surrounded by a number of villages (open settlements). The archaeological excavation in Grzybowo has been conducted by Mariusz Tuszynski, author of this WWW site, on behalf of the Poznan Society of Friends of the Sciences. Dr. Zofia Kurnatowska from the Polish Academy of Sciences acts as the scientific consultant.